In the U.S. from 2000-2011, autologous (cycles using a woman’s own eggs) and donor ART procedures were associated with low reported stimulation risks, as well as low surgical complications risks — even as more women turned to ART for reproductive help. ART includes all fertility treatments that involve handling eggs and sperm. Treatment includes the surgical removal of eggs from a woman’s ovaries, combination of the eggs with sperm, and then transfer of the resulting embryo to a woman’s body (either the patient herself or an egg donor recipient). Researchers say that in an effort to improve patient safety, ovarian stimulation protocols have become less aggressive, oocyte (the egg before it is released at ovulation) retrieval has transitioned from laparoscopic to transvaginal, and overall pregnancy rates have improved. However, there is limited published data regarding maternal complications. 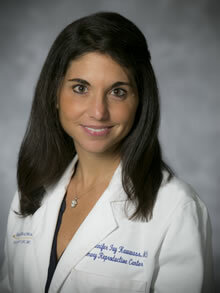 “This is the first published study using the National ART Surveillance System (NASS) to investigate complication patterns in the U.S. over a 12-year period,” says Jennifer Kawwass, MD, assistant professor of gynecology and obstetrics at the Emory Reproductive Center, located at Emory University Hospital Midtown. NASS is a federally mandated reporting system that collects ART procedure information. Reported complications (defined as having been directly related to ART and occurring within 12 weeks of cycle initiation) include infection, hemorrhage requiring transfusion, moderate or severe ovarian hyperstimulation syndrome (OHSS), medication adverse events, anesthetic complications, hospitalization, patient death within 12 weeks of stimulation and other complications. Among 1,135,206 autologous cycles, the most commonly reported patient complications were OHSS (peak of 153.5/10,000 autologous cycles) and hospitalizations (peak of 34.8/10,000 autologous cycles). Rates of other complications remained below 10/10,000 cycles. Rates declined from 2000-2011 for reported medication adverse events and hospitalizations. No other significant trends were detected among reported infections, hemorrhages, OHSS, severe OHSS, anesthetic-related complications and deaths within 12 weeks of stimulation start or during pregnancy. OHSS is an over-response to the use of ovulation induction medications that has the potential to be dangerous if not managed proactively. Fifty-eight total deaths were reported in the study (18 stimulation-related and 40 maternal deaths prior to infant birth). No donor deaths were reported.